I make children's shoes from soft suede or unlined leather so they are able to move their toes freely and spread their toes out as they develop and move. Making them from unlined leather or suede means they can stretch a little more and get a built more wear out of them when they grow, as they very quickly do! The lasts I use (foot shaped model I work around) is very wide at the toe box, allowing the toes to spread in their maximum form, while the heel is firmly held into the back of the shoe. The inside of the shoe is completely flat so as to allow for the muscles of the arch to develop as it naturally should. All the soles are completely flat. The innersole is soft pliable leather so your child's foot will mould and shape the sole. 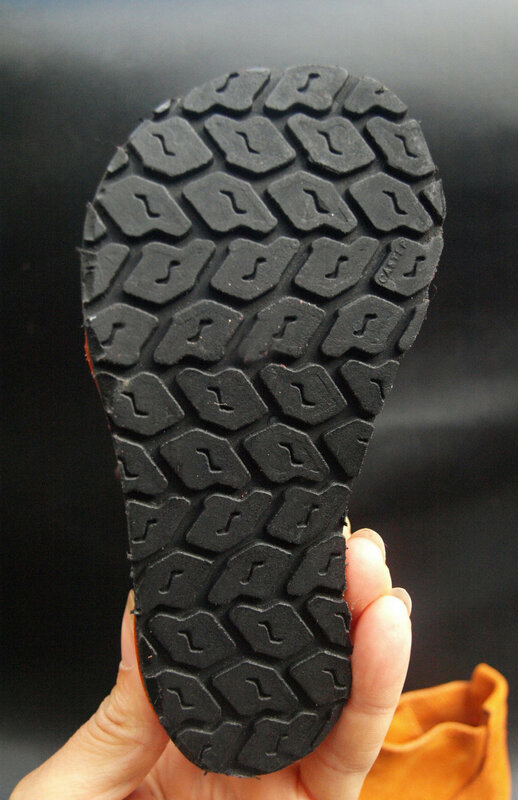 These are finished with recycled tyre tread sole which is replaceable when worn out. Please see my shop for pairs available to buy ready made or send foot measurements as normal if you want them made to measure.